Engineered to manufacture complex cutting tools, the new Star NTG-4L tool and cutter grinder is a five axis, CNC controlled cutter grinder for manufacturing, sharpening and reconditioning a wide variety of cutting tools. Made in the U.S.A. and equipped with a four-station wheel pack changer the NTG-4L is built for high productivity and precision. The machine features include a mineral cast base for increased damping and thermal stability performance. All three axes are driven by linear motor technology, which eliminates almost all elasticity, backlash, friction effects, and drive chain vibration typically found in ball screw and belt driven designs. Both of the NTG rotary axes are have integrated torque motors for high and precise torques at optimal speeds. The machine is ideal for high mix, low volume jobs due to its quick setup and stability. For the high volume manufacturer, an optional robust automation package utilizes a Fanuc LR Mate robot allowing for an increase in productivity without sacrificing quality. Partnered with the flexibility that comes from NUMROTO software, the NTG-4L is designed and tested to have years of worry free production and backed with world class service featuring 24 hour response time performed by factory trained technicians. Star SU (Booth N-6924) will exhibit this machine during IMTS in Chicago, Illinois, September 8-13, 2014. 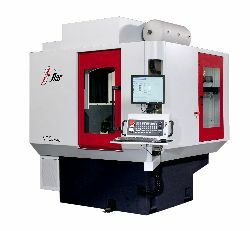 Learn more about the NTG-4L, request a quote and plan to see it at IMTS by visiting www.star-su.com.